We worked hard in 2012 to enhance our products. Apart from bug fixes we have added several new options. All our converters run faster now due a new technology introduced last year. Besides, all of them support PDF/A format (both in and out). Find the list of new options in the programs below. 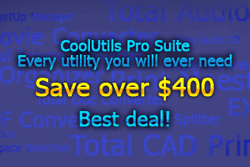 Good news: if you purchase CoolUtils Pro bundle upgrade now, you will get all the major upgrades of our programs released in 2013. All your new keys are valid till January 2014! Email us at [email protected] with any questions or concerns. - The new version supports both short and long YouTube urls. New - now supports ODT as the target file type. Convert HTML files to OpenOffice formats! New - supports OST files (offline folders file in Microsoft Outlook). New- converts emails from Zimbra and Lotus. Detects and deletes blank pages from PDF and TIFF files. New - now can add the name of the file to the header and footer of each page. New - adds watermarks now. New - has an improved engine to convert XLS to PDF and HTML. Split PDF files as you like! It can convert, crop, resize or watermark any image in no time! New - allows selecting BW algorithm when converting JPEG to PCX. No problem. We have developed a most time-saving tool - Total Folder Monitor. It watches any designated folder and when the new file arrives executes predifined action. In plain words Total Folder Monitor automatcially converts to other format any incoming file. Just think how much manual work can be done automatically by CoolUtils software! Learn more about Total Folder Monitor to automate more of your everyday routines.